So… it was the night before halloween, and two friends and I were lost about what we should do for Halloween. None of us had ever made a costume, but none of us wanted to recycle through purchased costume of yore. So, we thought what would be the easiest costume with the biggest level of awesomeness. 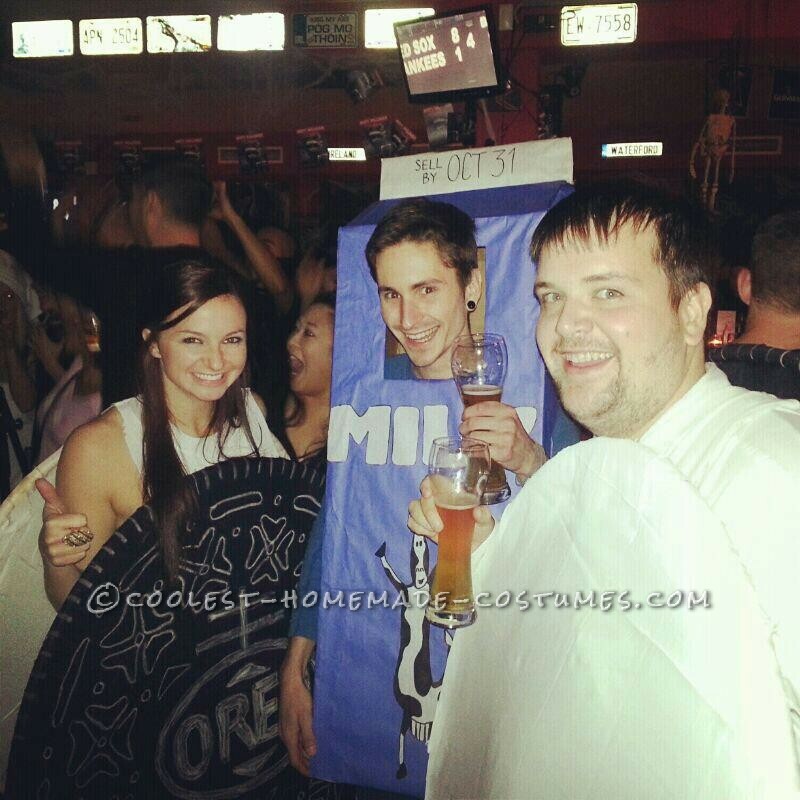 We went with Milk and Cookies (Double Stuffed Oreo) group Halloween costume. We bought 2 big hula hoops, 2 slightly smaller hula hoops, white bed sheets, black bed sheets, hairspray, chalk and an old white t-shirt (but you can use the scraps from the white fabric). Glue gun and some sort of projector were used. We used a projector to project the image of an Oreo onto the black fabric. I adjusted the image to be the size of the large hula hoop. I then traced the image with white chalk. This didn’t take as much time as it appears. When it is chalked, I hair sprayed the whole thing, so that the chalk doesn’t smear. The chalk gets dull when wet, but the color will come back when it dries. Once dry, I cut out the Oreo design, leaving a few inches away from the design. I then taped the hula hoop to the back of the design. Luckily, the chalk was visible on the back sign so it was easy to align. I then cut two inch wide strips from the edge of the fabric to right under the hula hoop. All that was left was to glue the strips over the hula hoop with a hot glue gun. 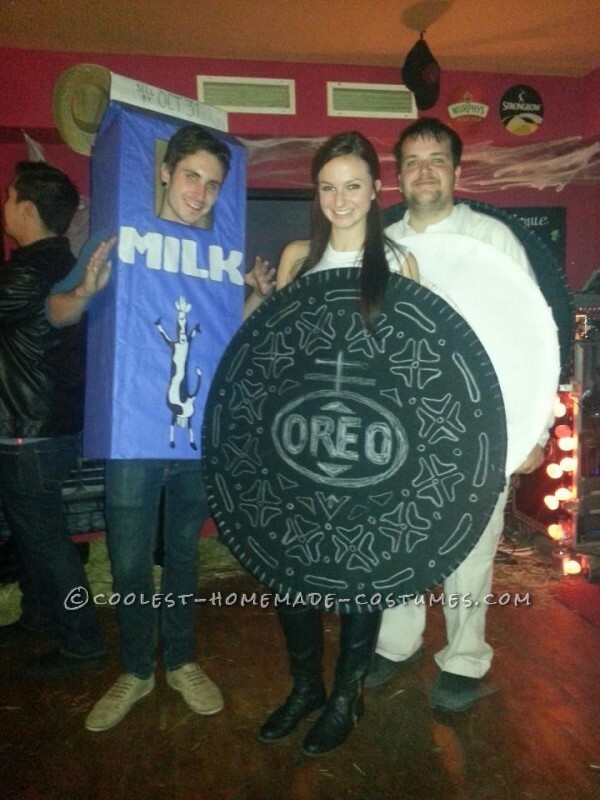 If you are doing the Oreo as two people, repeat above. Then do white fabric on the smaller hoops, but obviously skip the design and go straight to the cutting and gluing. If you want to do it as one person, don’t buy white fabric or the smaller hula hoops, but do another black hula hoop without the tracing. 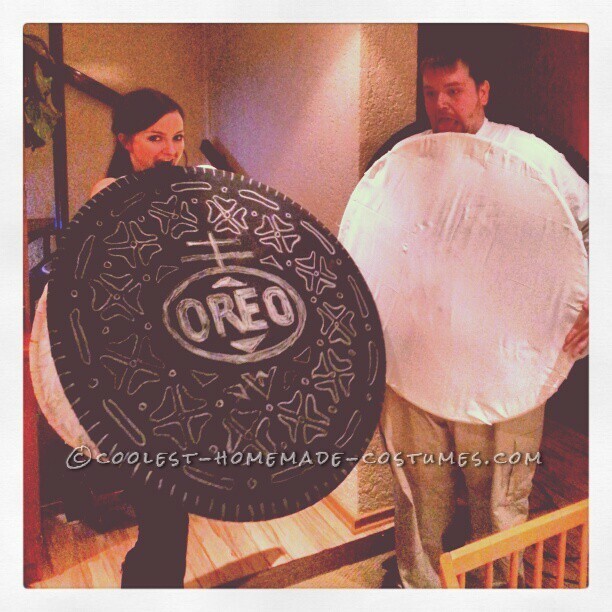 We recommend doing tracing on both sides of a two person Oreo, because if you get separated, well, people might not understand your costume. Anyhow, once you got your front and back, we took an old t-shirt and cut off the sleeves and the sides to leave just the collar and front and back panels. This we glued to both of our fabric hula hoops. This made it easy to take on and off (which is necessary for being in a car). We found a box that fit our friend perfectly. We cut out a little at the bottom, and folded them just so to make the detail at the top with the flaps of the box. We then traced out the arm and head holes by putting the box on top of him when he was laying down. We then covered the box in blue. The milk here has those cows, so we just pulled up the image and traced it. On the back, it still says milk, but it has a bigger cow. Did I mentioned that this won us a trip to Ireland?